My Uncle Martin turned 102 this year. He was my grandmother’s youngest sibling, and he is the last one still living. 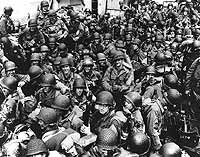 Army troops on board a LCT, ready to ride across the English Channel to France. Some of these men wear 101st Airborne Division insignia. Photograph released 12 June 1944. Official U.S. Navy Photograph, National Archives. He was 94 before my mother (his niece) and I learned that he had been among the American troops to storm the beaches of Normandy in June 1944. We were at my grandmother’s memorial service when Uncle Martin mentioned his role in history as casually as is he were telling us what he’d had for breakfast. I don’t remember why he mentioned it, but I do remember he wasn’t expecting gratitude or accolades and he certainly downplayed his role. “I wasn’t among the first to arrive,” he said when pressed. And that’s about all he said about his role in a defining moment in history. He saw himself as a bit player, and I saw him not only as a hero, but as my own personal link with history. To me, he was a rock star. He also put the importance of our veterans in context. I may not like war, but I like oppression even less. And without our veterans, individuals who put their lives on the line for people they will never even know, my view of oppression would be from the inside out rather than the outside in. Which is why, on Veterans Day, I have to give a shout out to my Uncle Martin and to all the other veterans who protect my right to write. Posted on November 11, 2013, in Family, My life, perspective and tagged 365 reasons to smile, Family, gratitude, Normandy, perspective, respect, smiles, Veteran's Day, Veterans, World War II. Bookmark the permalink. 63 Comments.